Today I learned a valuable lesson about respect. Respect for mother nature. She provides us with wonderful things we all enjoy. For me, I was using one of her rivers in an attempt to catch her bass. To prepare for the upcoming May KBF North Central Great Lakes tournament hosted by TourneyX, I pre-fished a nearby river. I've fished rivers, but never by kayak. 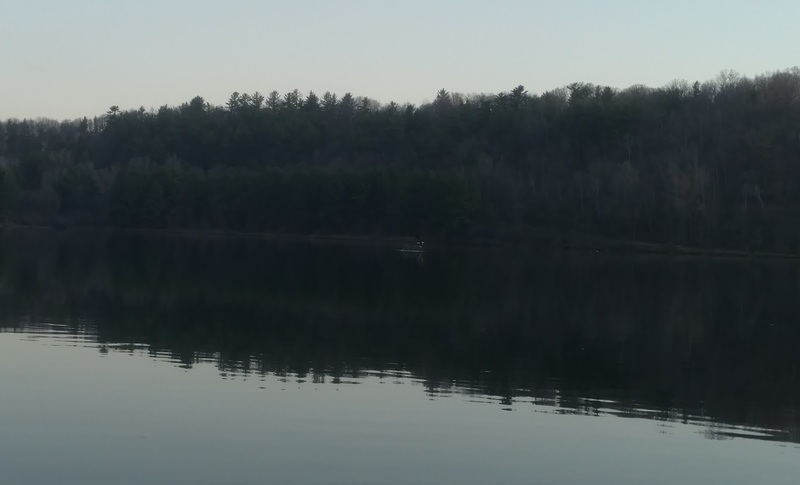 I prefer the calm lakes, but bass season is closed until May 7 here in Wisconsin. 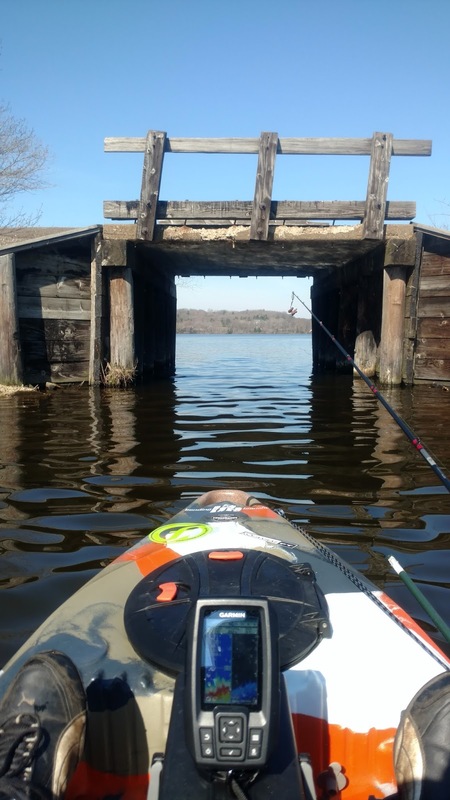 I was up for a new challenge, blinded by the possibility of catching my first bass of 2016 in my new-found love (my FeelFree Lure kayak). My goal was to launch shortly before sunrise. The night before, I ceremoniously removed my bass trays from my tackle box and placed them in my kayak crate. 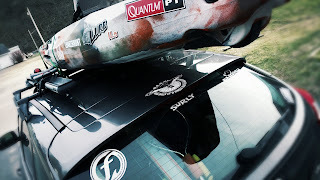 I loaded the rest of my gear into the car and strapped the kayak on the roof. After a Wisconsin winter that refused to give way for spring, finally. I was actually going bass fishing! I enjoyed the evening with a few beers and the family and set my alarm for 5:00 AM. My alarm awakes me and I roll out of bed. Knowing the morning was going to begin cold, I slip into my top layers typically reserved for winter fatbiking. I place my go-go juice (caffeine) in the cup holder and am off to the river. This is my first time fishing this river. Being April in Wisconsin, it has been rainy recently. However, I was about to fish for bass. As I pull up to the launch site, I notice the water seemed a bit high and fast. Geese were swimming in it, so it can't be that bad. I had my Bass Goggles on. 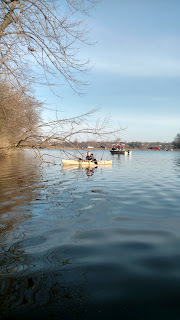 I go through my routine of unloading and gearing-up the kayak and wheel it to the launch. A beautiful, but unseasonably cold (36 degree) morning. I'm sure it will be fine. 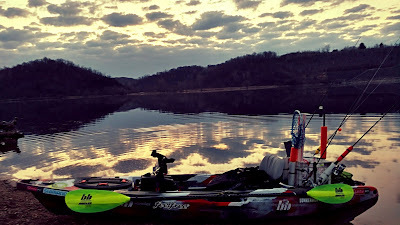 My FreelFree Lure is stable as a pontoon boat and my Bending Branches Angler Pro paddle is light and slices like a katana. After snapping a picture capturing the beauty of the morning, I launch. It isn't too bad...sure, it is cold. But I have fatbiked in -30 degrees. I paddle upstream while keeping a keen eye on my Garmin sonar's temperature reading.....it isn't rising as quick as I'd hoped. I paddle on. Well short of my planned starting point, my Bass Goggles slightly de-fog. This current is faster than I thought.....no problem. I'll just start fishing here. I grab my DIY three pound dumbbell anchor. Given the current, I decide to attach the second three pound dumbbell. 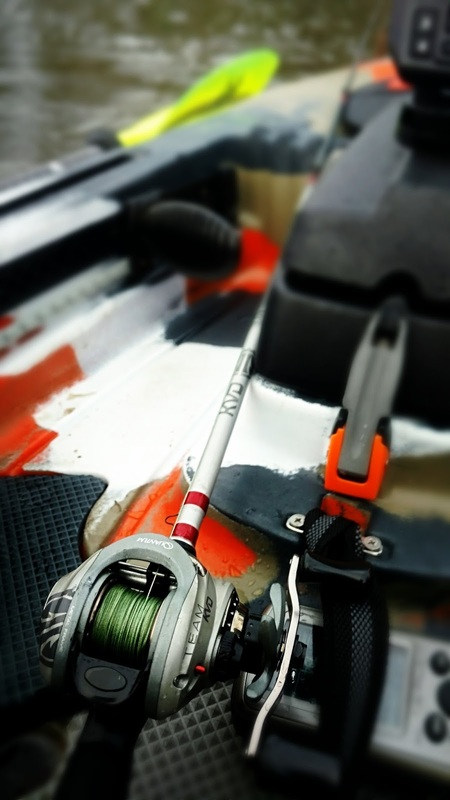 I clip my anchor rope to my anchor trolley, stow my paddle, and prepare my Quantum baitcaster for the first workout of the year. After a few moments of getting my kayak into fishing position, I notice I'm downstream of where I dropped anchor...and still moving. I consult my Garmin's speed reading to confirm. I'm moving 1.2 MPH while anchored with 6 lbs of weight. I pull anchor, re-position, and add my drag chain to the anchor party. Finally, I'm holding position and begin fishing. I'm throwing a 3/4 ounce football jig with a Havoc PitBoss trailer, a relatively heavy setup...and the current is carrying it like Emmitt Smith carrying a football. My Bass Goggles, still fogged, tell me everything is fine. This is completely normal. I continue fishing. I slowly work myself downstream. Hundreds of swallows awake as I silently float under the bridge. The local bald eagle has awaken and begins circling to find the next meal for his family. I notice rip-rap along the shore. The air temperature has not broken 40 degrees and the water temperature is a disappointing 51 degrees. The unseasonably warm Wisconsin spring has dropped the water temperatures. Rock holds temperature longer, so I'm hoping smallmouth bass are sticking to the rocks. After unsuccessful attempts working my jig and jerk bait along the rocks, I move further downstream. 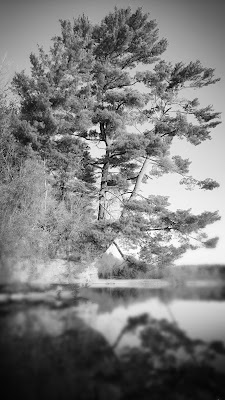 I drift upon a pocket of seemly calm water between the rip-rap and a large tree. Surely a bass would be sitting here, waiting for forage to float by... I toss my jig and the current takes it downstream... This isn't right.... Maybe if I toss it ashore and gently drag it into the pocket..... I successfully hit land. However, I wrap it around a dead bush I did not notice prior to casting. My 50 lb. Suffix braid is performing majestically. I cannot yank the jig out of the shrub. Having landed many-a-bass, this is my favorite football jig. The water is calm in this pocket. I'm sure this is retrievable. My anchor rope has some slack, so I use my Quantum/Suffix setup to pull me nearer. I notice the current between me and the pocket is swift. I put my rod down and begin paddling towards the pocket. Things turned for the worse. Quickly. Broadside to the current, the current in front of the pocket shoves me towards the tree. Of course, I have three other poles in an upward position, waiting for action, in the back of my kayak. In an attempt to paddle away and free them, my paddle gets wrapped in my line. I put my paddle down and grab the tree branches. One of my poles managed to stay free of the branches. My ultralight was not so lucky. Fortunately, I was able to easily snap the 4 pound test wrapped around a branch. My paddle falls into the river and is now under the kayak. Fortunately, my paddle leash allows me to retrieve it. After the paddle is secured, my braid is still an issue. 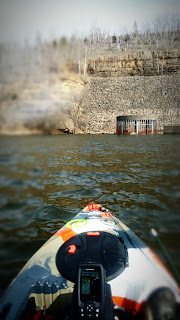 My adrenaline is pumping as the current slaps against the side of my kayak. While holding the tree with one hand, I grab my razor sharp straight-blade knife off the sheath attached to my PFD. I cut the braid and allow myself to float away from the tree. As I collect myself, my GPS shows a speed of 3 MPH. I look up and am quite a distance downstream. The wind has picked up. This is not over yet. I drop my seat to the low position and begin paddling upstream. Given the head wind and strong current, I watch the speed on my GPS to confirm if I'm making progress. I'm paddling upstream at 1.2 MPH. Honestly, I was impressed. 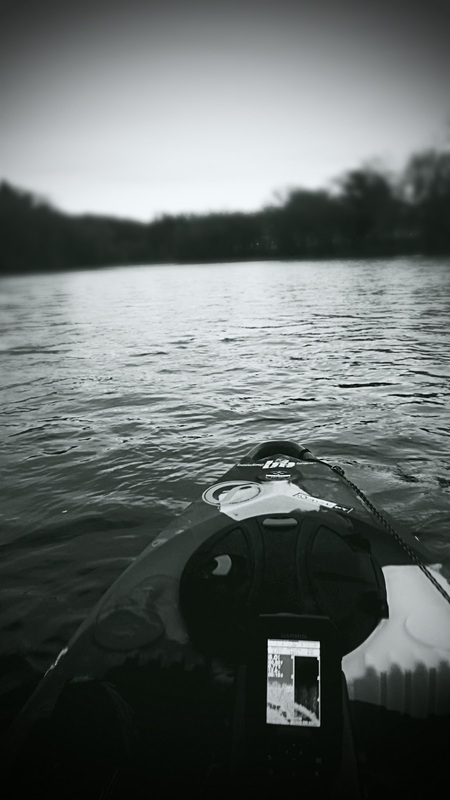 A stable, wide, fishing kayak is going upstream in strong currents and a head wind. I'm going to be OK. I love this kayak and paddle. Paddling back to my original starting point, I drop anchor. Shortly thereafter I manage to snag my swimbait and jerkbait together. I lose the swimbait and almost completely de-spool my spinning reel the jerkbait was on. My Bass Goggles fall off, and I call it quits. I am cold, tired, nearly went for a swim, lost my favorite jig, and lost my new swimbait. I need to cut my losses and come back when Mother Nature has calmed down. The unseasonably cold spring temperatures and recent rains caused the water temperature to drop and the levels to rise. I let my Bass Goggles cloud my judgement and it endangered my safety. Lesson learned. I am not affiliated with FeelFree Kayaks or Bending Branches paddles. However, I truly believe their high performance, quality, products prevented me from going in the water today. Given the air temperature, water temperature, and currents I'm sure I would have been in grave danger. I thank them for their amazing products getting me out of a bad situation. I'm an inexperienced paddler. Had my equipment been of lesser performance or quality, I'm sure the outcome would have been worse. Be safe, think with your head, and recognize when you have Bass (or other) goggles on. It isn't worth the risk. I love fishing. 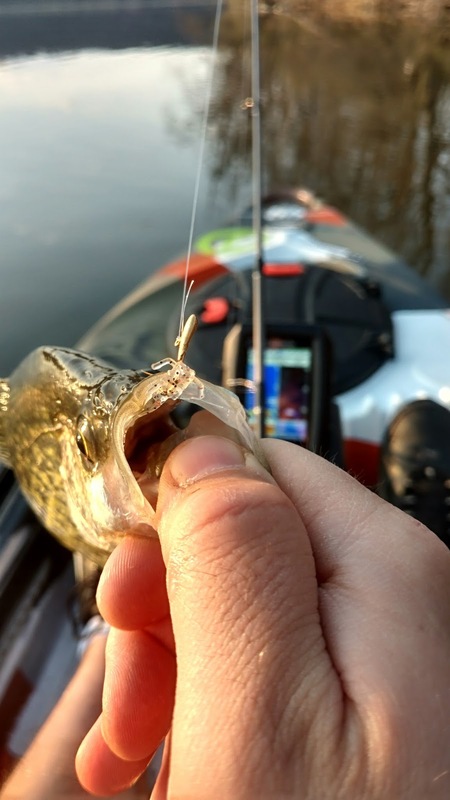 I love fishing from a kayak from my FeelFree Lure more than expected. I recently decided to go all-in. I registered for the Minnesota Kayak Fishing Association Fishing Opener Online Tournament. 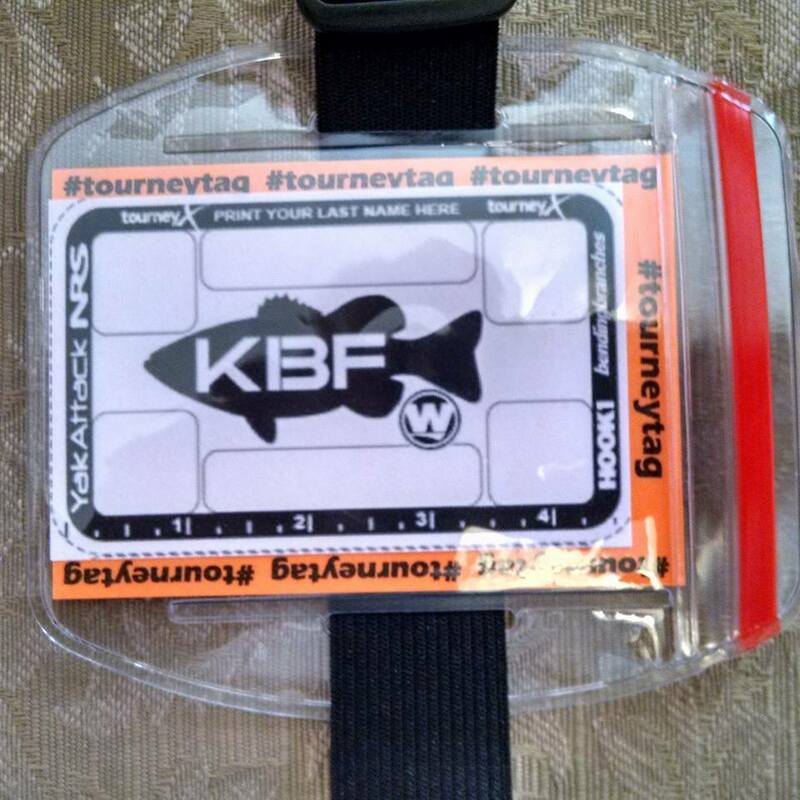 I have also registered for the Tourney X Great Lakes Regional tournament in May hosted by Kayak Bass Fishing. 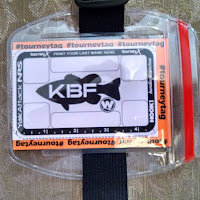 To ensure my tournament identifiers are properly preserved and displayed in my CPR (catch photo release) tournaments, I'm anxiously awaiting my recently ordered Tourney Tag. If you are in CPR tournaments, check these guys out. Their versatile product protects your identifiers exponentially better than your run-of-the-mill sandwich bag. In addition to entering the kayak fishing tournament trail, due to the overwhelming social media feedback on by blog, I am awaiting review from Amazon for my blog to be available to Kindle readers! I will surely share the link on my blog, Facebook page, and Twitter account once approved. I'm also working on an Instagram account and YouTube channel to bring everyone the full SCF experience! I wanted to take a moment to thank the above companies and groups that are allowing me to enjoy and share my passion with my readers. I don't expect this passion to pay the bills. But rather show my readers and children that anything is possible. Many say if you do what you love, you never work a day in your life. I respectfully disagree. Do something that pays the bills, you can tolerate most days, and you love some days. Pursue your passions, but not to the extent that your passions become a "grind". The only thing worse than a job you loathe is a passion dissolved out of necessity. No excuses. Rain or shine. The love of fishing with the "no excuses" approach has served me well in the past. I've caught some of my best bass in rainstorms while others are warm in their homes. 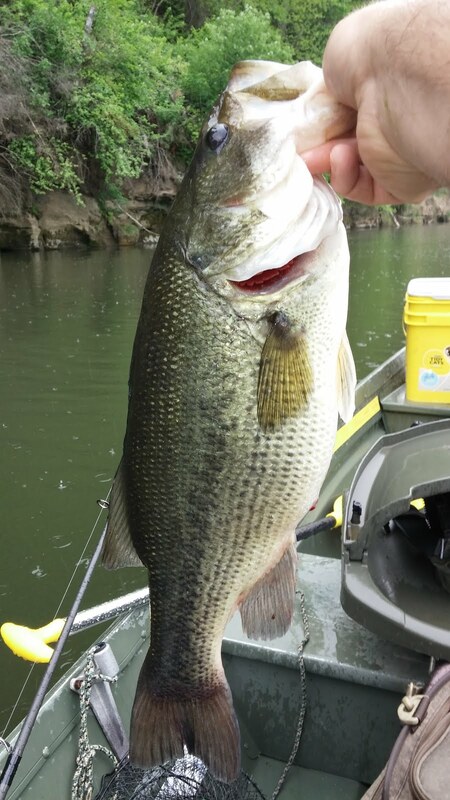 Last year I landed a nice largemouth in my Jon boat while a good Samaritan was cleaning up the river bank. He looked up while I was admiring the beautiful 19" fish and said, "Wow! Nice fish!". I smile and release her so others may enjoy catching her and the future generations she will create. The good Samaritan yells, "What!?!?! You aren't keeping that fish?!?!". I reply, "No, I'll let her make more bass and be caught again." By the look on his face, you would have thought I was skinny dipping in the river. We silently agree to disagree and carry on as we were. To clarify, I occasionally keep fish for a Wisconsin fish fry. I believe people are free to choose to keep or release fish within the local laws. But I am teaching my daughter, who loves to fish, the importance of sustainability of fisheries for future generations. In some waters, the size and numbers of species are dropping. I enjoy the sport of fishing and want my children and future generations to be able to enjoy it as well. But I digress. With bass season closed in Wisconsin until May 7th, I had every intention of a "no excuses" rainy bite this morning from my FeelFree Lure kayak. A local stretch of river is open to bass fishing year-round. Ever since the water has opened and risen to spawning temperatures, bass fishing is an itch I need to scratch. My kayak and rain poncho were loaded last night in preparation for today's forecast. I woke up this morning to red on the radar. I'll fish in wind, rain, ice, and snow. I draw the line at lighting. As the rain slows, I check the radar. My eyes light up like a kid's on Christmas morning when the radar confirms light rain for some time to come. As I begin to gather my clothes for the trip, I realize I failed to check the temperature. It is in the 40's. Passion, drive, and the "no excuses" attitude is great, but common sense should be greater. I'm not properly equipped for conditions guaranteeing hypothermia without proper attire. The radar also shows heavier rain north of the river, sure to cause higher water levels and stronger current. Though disappointed as my itch to kick off the 2016 bass season grows, my glass-half-full wife points out I can now spend this lazy Sunday with the family. I make the best of it by spending time with the family and catching up on my blog's social media accounts. In attempt to abate the itch I reminisce on my last big catch on a rainy summer day of the past. Until the temperatures rise, my "no excuses" approach will be overridden with a "common sense" approach so that I can fish another day. Enjoy your passions, but be smart so you can enjoy them another day. Like Harry and Lloyd from the movie Dumb and Dumber, I've got worms. Well, my daughter does. But the are the good kind - night crawlers. Up until the end of last year, she was afraid of touching my plastics, let alone night crawlers. 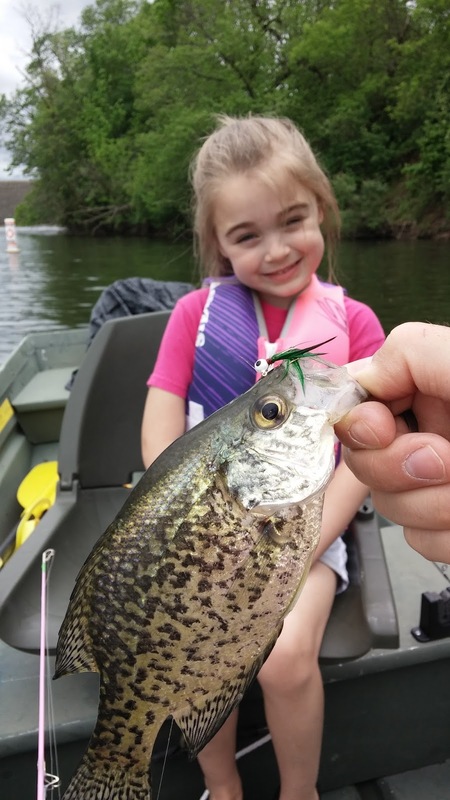 Though I am a bass fisherman at heart, I target panfish during ice fishing, when bass season is closed in Wisconsin in the spring, or when fishing with my daughter. Her favorite fish to catch is crappie. (As of last year, she catches them but doesn't touch them). Towards the end of last season, she suddenly lost her fear of touching worms. With spring (finally) arriving in Wisconsin, she has filled me with pride and embraced the hobby of worm hunting. She loves the outdoors and nature. She also enjoys fishing (though our trips usually end with a trip to build sand castles at the beach). This spring, she has also convinced her friends digging for worms is fun. In this iPad/tablet generation, I was proud she was willing to dig in the dirt. 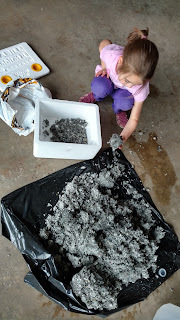 I was also proud of her interest in worms and what was required to raise them to maintain our own fishing bait. I quickly grabbed this opportunity to buy a Frabill Worm Habitat, bedding, and worm food. When I brought her home form school today, her face lit up like it was Christmas morning when she seen the Habitat, bedding, and food sitting in the garage awaiting to house the 40+ worms she collected over the weekend. We quickly got to work setting up her worm's new home. Amidst the efforts, her friends were yelling for her to come play with them. She followed through on her responsibility of transferring the worms for their inadequate dirt container to the Frabill paradise. Impressive at 5 years old. After fishing the transfer, the worms smiled, waved, and burrowed into their new bedding. She ran off to play with her friends while shouting over her shoulder, "Dad! Can you dig for some more worms in the yard for me?!". Naturally, I obliged and was again filled with pride when she came back to our worm mining location with two friends in tow. The three 5/6 year old girls added over 30 more worms to the family. Before bed, my daughter checked on the worms to make sure they were doing OK and looks forward to giving them their first feeding in a few weeks. Today's youth are surrounded with instant gratification. The Internet, tablets, flat screens, streaming video, etc. I was appalled when my daughter was recently playing a game of chores for kids. She was actually doing chores on her tablet, and considered it fun. When I suggested doing the real chores, she looked at me as if I were crazy. Thus, I feel like my wife and I are doing well as parents when she takes a keen interest in the outdoors and things as simple as this. Some may say a 5 year old girl shouldn't be digging in the dirt for worms to raise for fishing. I say, "Why not?" Her and her friends are learning the value of hard work, getting their hands dirty, and being responsible for something. Fishing, worm farming, and many things in life do not provide the instant gratification available to us today. It takes work, patience, understanding, and failure to succeed. I'm not saying every child should have a worm farm. But it is important for our children to learn the value of hard work and the result of said work. So, do you have worms? Yesterday I was out of my comfort zone. I got skunked. I love the experience gained from fishing new waters and meeting new people. However, a part of me is bothered when I'm skunked. Whether the cause of said skunk is fishery or fisherman, it hurts a little. To get the skunk off of me, I visit my home reservoir. I've spent countless hours learning every inch of the water and features beneath. This is my homefield advantage, my comfort zone, my place of peace. I don't get skunked here. On the contrary, this place gets the skunk off of me. It is my tomato juice. On this beautiful (finally) morning in Western Wisconsin, I launched at sunrise. The reservoir was all mine. The water like glass, the skies clearing, and the panfish feasting on the bugs now emerging from the cold. The sight of my FeelFree Lure awaiting to carry me into these perfect conditions made me smile. With the calm conditions, I took a moment to use my new Garmin Striker 4DV to get a better view of some structures my previous finder had a hard time identifying. 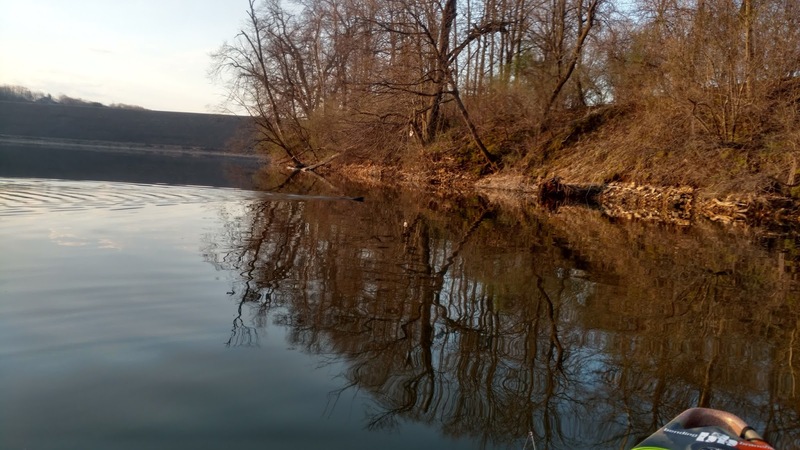 Though normally productive, these scouting locations aren't productive until the water temperature is a bit higher and bass fishing is in full swing. As I looked at these structures, I yearned for my football jig and Havoc PitBoss trailer.... I quickly shake it off and paddle towards my favorite panfish crib since bass season is closed in Wisconsin on this perfect morning. The weather is so calm, I'm able to float without anchor. I'm marking schools of fish everywhere. 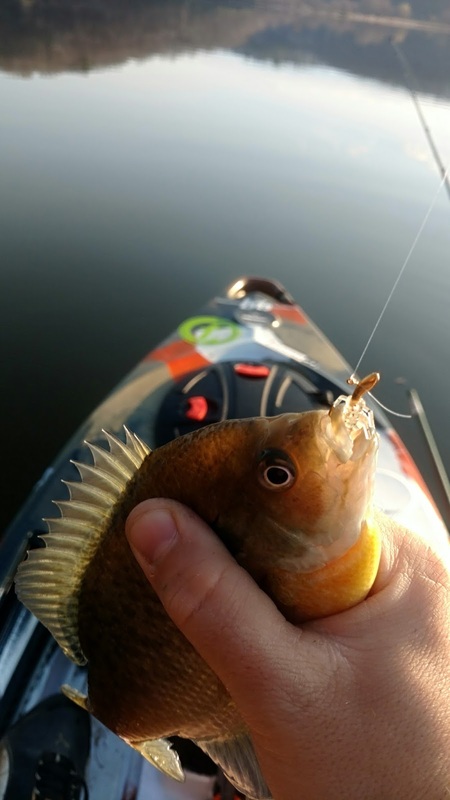 Though the bite is slower than usual, I'm able to quickly able to redeem myself with a Panfish Plastics Chigger Fry on my ultralight. Finally, my first open water fish of 2016. My first fish landed in my FeelFree Lure. While focusing on my sonar for the next school I'm targeting, I took a moment to appreciate the outdoors. I'm in a fishing kayak designed for fishing, stability, utility, and comfort. Most importantly, it is simple. I'm not messing with a trolling motor tilt, battery, plugs, etc. I'm sitting comfortably close to the water on a picture-perfect Sunday morning after a grueling Wisconsin spring. I notice a beaver family silently swimming through the water working on building me a new fishing structure. I also witness one of our local bald eagles circling close looking for his next meal. I'm able to watch him approach the shallows and scoop up a fish with a precise dive into the water. Shortly after he disappears into the trees I hear him call out, announcing his bounty. I slowly turn back to the task at hand. Proving my worth as a fisherman. I continue to work the panfish cribs where the Panfish Plastics Chigger Fry continues to produce, as per usual. My trip is a success. Whether fishing or navigating life in general, everyone needs a tomato juice to normalize them after a trying situation. It helps make you whole again, regain your confidence, and make you feel at home. Life is insane. Your tomato juice washes the skunk off and brings you sanity. What, where, or who is your tomato juice? I consider myself a bass fisherman. I'm an equal opportunity fisherman, and am happy to catch any species. However, I know bass best. This time of year, the Wisconsin Department of Natural Resources dictates bass off-limits for inland waters. I am also intimately familiar with multi-species hot spots in my local reservoir. 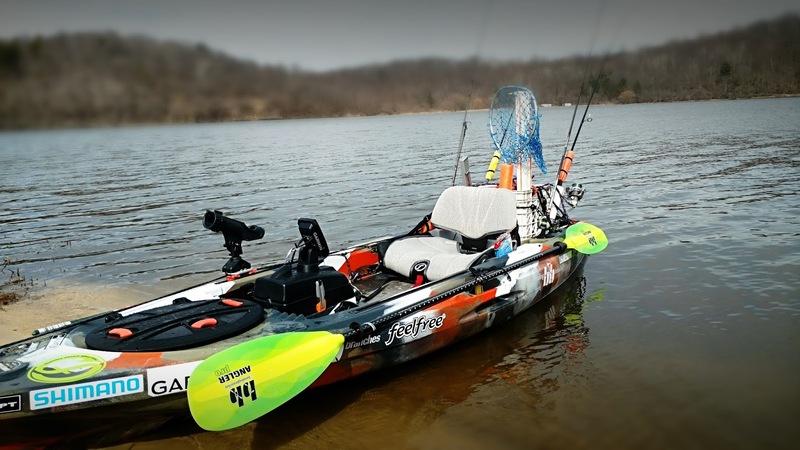 In addition, I have recently chosen a kayak as my primary fishing vessel over my Jon boat. 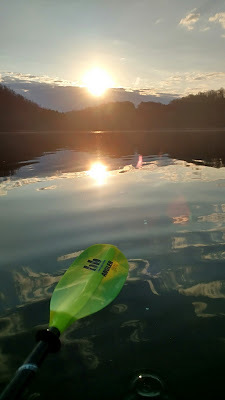 I have also chosen to connect with fellow kayak angers via social media. Today, the comfort zone of my species, local reservoir, and fishing partner were abandoned. This morning I targeted panfish and rough fish on a new lake with a new fishing partner. It. Was. A. Blast. Sure, I was not properly prepared, as my new fishing partner was, with minnows. However, it was a new experience. 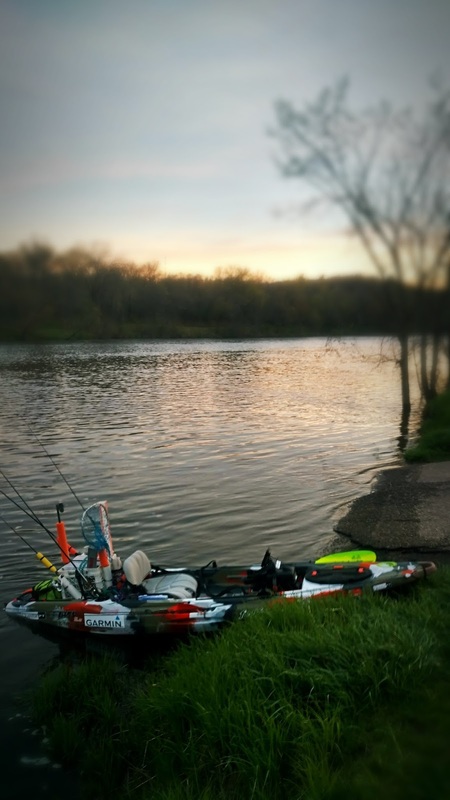 I enjoyed the new waters, meeting a new fellow kayak angler, and learned a few things about fishing. The most important is to have the proper bait for the species and conditions. The second is a crappie rig with crappie minnows will outfish nightcrawlers. To be honest, today was hard. The conditions were great. My FeelFree Lure and Bending Branches Angler Pro were amazing. However, my Garmin Striker 4DV immediately reported a water temperature a majestical 52 degrees. This is the temperature that triggers the largemouth bass spawn. My heart skips a beat as I look at my baitcaster while yearning for the bass tackle trays I left in my vehicle. Floating a FeelFree Lure on a 70 degree day, with 52 degree water, with a Quantum baitcaster, with 50 lb. braid, with bass trays in the car is like driving a Formula 1 car in a funeral procession. It is difficult. However, I was going to make the best of the trip. Sure, I got skunked with my nightcrawlers. I missed some big bites while my new fishing friend hauled in nice crappie. However, it was a beautiful day. I had great equipment, and was able to enjoy new scenery. My new fishing friend also did well with a nice haul of crappie. I fell in love with bass fishing as a child. I remember my dad taking me to the cranberry marshes where we lived in Tomah, Wisconsin where we regularly caught monster bass. We moved to Richland Center, Wisconsin when I was in fourth grade. Shortly thereafter he upgraded to a nicer boat and made it a yearly tradition to take my friends and I fishing at the end of the summer before school resumed. These memories started my love for bass fishing. As a father, this holds strong in my mind. My daughter is nearly six years old and loves fishing (though she bores easily as I did at that age). She loves going out on the jon boat at our local lake. She is great at fishing, though she isn't quite ready to handle the fish. She still has a love for the sport kindling. Today we were shopping at Scheels Sporting Goods in Eau Claire Wisconsin. While waiting for my wife to find some baby clothes for my three-month-old son, I decided to take my daughter to Scheels to pass the time. We immediately found ourselves in the fishing section. After a disapproving look from another shopper when asking my daughter if I could sell one of her kidneys to buy a new fish finder (it was a joke intended to highlight the prices of the new units), she asked if she could get some bait. Naturally, I obliged. She carefully looked through the various options and chose a black and purple jig. I approved, as she does not currently have the critical jig in her growing tackle box. We continued through the isles and came to the frogs. "Daddy, I want a frog like yours. ", she said. My face must have beamed with pride. Of course, I was proud and could not deny her this request. 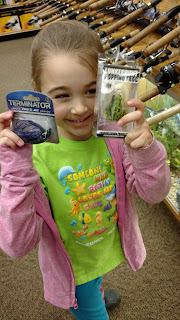 She recognized the Lunkerhunt frogs I prefer and asked me which color I had. Impressed by her recognition of my highest producing bass lure from last year, I showed her the colors I had. She chose the smaller version of my favorite color. I had her grab the popper version for versatility in open water since she is using my childhood Zebco 33 with mono line. Its moments like this that make it worth it. I look forward to the summer where we spend time together in our local reservoir on our jon boat. After a couple hours of fishing, we will pull up to the beach where she will play in the sand while I fish from shore. We will end the trip by doing donuts while receiving disapproving looks from those landing their boats at the dock. Teaching my daughter to catch fish, have fun, and not to take life too seriously. After all, we never get out alive. Enjoy it while it lasts. Ever since my Feel Free Lure 11.5 was delivered, I have been itching to take it out on my local reservoir. Ever since the end of last open water season, I have been itching to get back out. Though I enjoy ice fishing, there is nothing like the gentle rock of a small boat on summer days. And gliding over smooth-as-glass water as the sun comes over the horizon on summer mornings to burn off the night fog. Today was not one of those beautiful days. 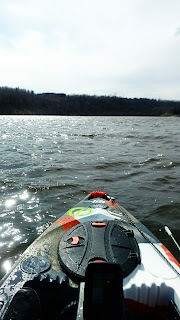 Though it was in the high 50s in Western Wisconsin, the water was 41 degrees and choppy with 20 MPH winds. I couldn't stand it anymore, I must get the kayak out for the maiden voyage......because I can't find where I put the Jon boat plug last fall... Bass season is closed in Wisconsin, so I leave the jigs, frogs, spinbaits, and buzz baits in the tackle box. I load my crate with my hook tray and my ice/pan fishing boxes. I'm looking forward to using my favorite ice and panfish plastic, the Panfish Plastics Chigger Fry. I arrive at my local reservoir and slip the kayak off the car. I carefully begin loading my crate, rods, paddle, and sonar pod while people hiking around the lake look at me like I'm crazy kayak fishing in these conditions. I don't care, I want to get my new rig out. I have ridden fatbike in the snow in 30 below zero. As long as I don't go for a swim in 41 degree water, I got this. I roll the kayak down the beach and launch. I immediately notice this kayak is more stable than my Jon boat. I'm in love. But now it is time to learn quickly on my first paddle of a kayak. I have an audience and cannot look too ridiculous, since I have a fully rigged kayak with various logos on it. The wind is a bit of a challenge and I'm getting a bit more paddle drip than expected. However, a few slight adjustments and I was headed upwind/stream to the river. The river is 9 feet deep, feeding the reservoir. Usually a stained water, it is crystal clear from the recently melted snow. Geese are tending to their nests on the rock walls and banks. Lost in the paddling, I forget I was there to fish. Of course, in these conditions, my primary goal is to test my gear for bass season. I put a Chigger Fry on my ultralight and a nightcrawler on my baitcaster. 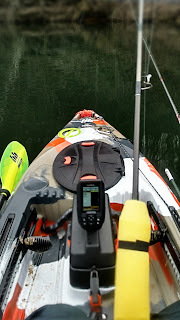 As I take in the scenery, and the downview imaging on my new Garmin, I let the kayak drift downriver back into the reservoir. This is where my Training Day begins. I am Ethan Hawke, my kayak the Monte Carlo, and Mother Nature Denzel. The river, sheltered by the rock walls and valley gently spits me out into the open reservoir. Here the wind whips through the valley, to the dam, and back again. I can feel every bit of the 20 MPH gusts as the whitecaps lapse against the side of the kayak. I'm marking fish at 25-30 feet of water and have 25 feet of anchor rope. I decide to batton down the hatches and hone my paddling skills. I preemptively lower the seat on my kayak and open the scupper plugs. I'm preparing for some serious paddling. My tri-hull FeelFree Lure tracks well, but my five fishing rods, Hawg Trough, crate, and net act as a sail. The big gusts spinning through the valley push my tail end as I counter-paddle carefully approaching the rip-rap on the dam. I decide to push my luck and paddle to the morning glory dam outlet. As I near it, Denzel unleashes hell. The wind whips down the valley and the whitecaps start curling over my bow. For some reason, I got a smile on my face and turned into the wind. I paddled steadily as on-lookers watched me from the shore. My kayak split the whitecaps as they lapsed over the sides of my bow. I watch my GPS and am pleased with my steady 2 MPH speed given I'm on my first paddle in a wide, loaded, fishing kayak facing a 20+ MPH headwind. I got this. After paddling across the reservoir, I near the beach where I launched. I considered heading back up the calm river to watch the geese and bald eagle, but decided not to push my luck. I just made a tough paddle in rough conditions. As I drift into the sand, I turn off my sonar and take a moment to appreciate my equipment. Never once in my FeelFree Lure did I feel unsafe. I was able to stand, take the whitecaps broadside, and move around for gear without fear of tipping. My Bending Branches Angler Pro sliced through the water without fatiguing my arms. The rest of my gear performed flawlessly. Just like in the movie, Denzel was defeated and Ethan drove the Monte Carlo off into the evening. On this Training Day I was thrown horrible conditions. I learned how to handle my equipment and learned it can get me through safely. I made it. Bring on bass season. There is just something about it, the addictions. 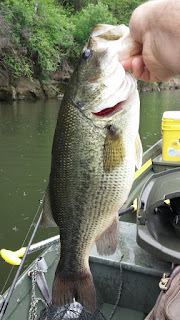 The first is the addiction to catching fish, bass, the topwater explosions. The outdoors. The second is pushing the limits of the small craft. Jon boats, canoes, kayaks, paddle boats, SUPs, etc. The addiction of pushing these low-cost, low maintenance crafts to seek bass. The adrenaline rush when you have a hit and go for a ride. Beyond my family, moments like this are what I live for. I also live for the repetition of these moments that cause the big bass boat weekend warriors to follow me, when my entire setup cost less than their electronics. Sure, I'd love a decked-out bass boat. But it isn't practical for my family. For my fishing, my 12' Alumacraft given to me by my father-in-law and my recently added kayak are what I enjoy fishing from. They push my creativity and planning. I can't simply fire up my 250 HP motor and cover any body of water I please. I must plan my lakes, floats, and launches. It pushes me to think harder about the weather, tackle, depth, temperature, and location. It forces me to be more like my great grandfather who was a skilled fisherman with a cane pole and crude lures (compared to modern-day lures). This blog is about my journey fishing from small craft. I hope you join me and enjoy the journey as I share one of my passions.